Torchwood is a Science Fiction TV Drama created by Dr Who Executive Producer Russell T Davies. It is a sub genre of TV Drama as a result but to avoid confusion, Science Fiction is categorised as a genre in its own right with its own set of codes and conventions – to say Torchwood is a sub genre of TV Drama simply means it fundamentally follows the conventions of many TV Dramas but has tweaked the representations a little to give it a Science Fiction feel. Russell T Davies wanted to develop an Americanised drama in the mould of Buffy the Vampire Slayer and Angel but with clear linking to Doctor Who through the character of Captain Jack Harkness who appeared several times in Doctor Who as a 21st century time traveller. 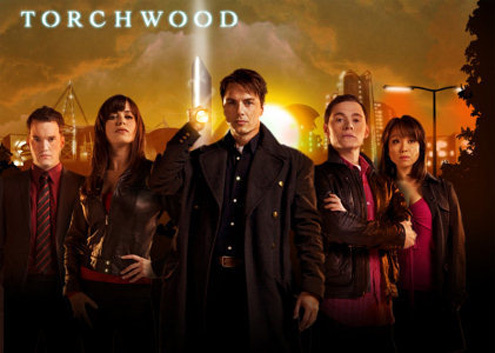 ‘Torchwood’ is also an anagram of the iconic series. Davies in the past had been responsible for developing challenging and critically acclaimed TV Dramas such as Queer as Folk (2000-2005) but with Torchwood and Doctor Who it was the first time he had worked with significant production values – CGI special effects, elaborate built sets and on location shooting, multiple camera technology, ensemble cast and high production value sound design.